If one keeps aquiring knowledge and applying it, it furthers more and more, until one comes to the ultimate realization. The teacher cannot make the student realize the knowledge, unless the student applies an endeavor. If education is only based just on sravana, it is incomplete. The education must lead the student to the need to contemplate. It is actually the jiva’s free will that determines whether he can contemplate on what he has heard. If the jiva desires to enjoy the material world, Krsna will give that opportunity, and same for Krsna consciousness. The ability to have the right desire depends on the anarthas. The anarthas from the heart should preferably be removed before the student reaches puberty, therefore education has to be started early. Samskaras help the child to develop good qualities, health etc, so that the process of education is more smooth. Srila Prabhupada mentions in a purport in the 16th ch. of Bhagavad-gita that if one wants one’s child to develop divine qualities, one has to perform the 10 samskaras for them. Samskaras are there to create an impression and to change consciousness. Samskaras should be done with an endeavor to change consciousness. Samskara is not just the yajna or mantras, it is the whole environment. When Samskaras are done properly in the right consciousness, it works. Samskaras are like good bank accounts for the children. In the mantras of the samskaras one surrenders to Krsna and asks for His help. Samskara is proper when the consciousness is elevated. If the occasions of samskaras are used just for socializing, it is not proper. There are various samskaras starting with marriage, then garbhadana, pumsavana, simantonayanam, jata-karma, niskramanta, nama-karana, anna-prasana, cuda-karana, vidyarambha, samvartana and then again vivaha. There is no guarantee that the child will be Krsna conscious, but we should make all possible endeavor. Because Maharaja Anga did everything he could for Vena, when he couldn’t change anything, he could just walk out without any attachement. Therefore from the very beginning we should try to do everything we can for the child. Samskaras constitute about 40 percent of the child’s character. The other 60 percent is formed by association. An adult can be trained if he has the desire to be trained. Without a training 90% of people will treat their kids the same way they were treated by their parents. If the second generation are not properly trained, they cannot actually be called the 2nd generation. One may learn by hearing, by seeing or by experiencing. But the main thing is that one has to realize, even though one would have to experience to do that. People realize by hearing from someone if there is a relationship. One always has to be a step ahead of the children and think what they would have to understand and how. If they don’t learn by hearing, one has to create an experience for them. The purpose of all the samskaras. The purpose of marriage is to make a commitment to cooperate together to advance in Krsna consciousness. Grihastha can easily realize that he does not want to come back to the material world due to the severe difficulties experienced. Who makes the first step – the teacher or the student? The teacher encourages the student to do what is good for him, but he cannot force. At the time that the child is interested in something, he is encouraged in that way, even though the interest does not last very long. Both the student and the teacher endeavor so that the student becomes elevated. Devotional qualities being developed depend on the single quality of surrender. The parents have to have faith in the teacher and encourage the child to have such faith. Then it is easier for the child to surrender to the teacher. Education is a cooperation between the parent and the teacher, not competition. The parent or teacher has to guide the child in contemplation. Menial services are the best opportunities for contemplation. When contemplation happens, questions come. When one makes a mistake, one simply realizes one way of how to not do things. The consciousness is the most powerful that we have and it can be on any of the 5 levels. Gurukulas should be established in many places, and the parents should know about the importance of gurukulas and demand them. Is gurukula only for brahmanas? All the children can take advantage of the gurukula system, but it will be different according to their different natures. Since one wants to go back to Godhead, one has to be comfortable with the lifestyle of the Lord. The form and activities in the spiritual world go along with the devotional mood. Since in the material world everything is about the secondary, we start with the cultural aspect of doing those things for Krsna, but people in the spiritual world follow the scriptural regulations out of spontaneous love. The form of the varnashrama system is the same as in the spiritual world. To not be convinced about Krsna consciousness is a lack of faith. On the madhyama platform one is fixed in devotional service because one’s faith is fixed. To understand which of Krsna’s activities we should follow, we follow the acaryas. There are four divisions of the curriculum are ashrama, academics, vocational and cultural. If there is not enough training in science, character and culture, people very easily get distracted by the arts and cannot function properly. In India, even the artists, musicians run like a Gurukula. A gentleman is cultured. Culture is the common thing among humans, no matter what is their varna or social background. Even if people say that one needs a degree, still the people hired are those who have some character. When ashrama side is strong, one will be able to learn. There has been no student in the Gurukula who had a good character who was bad in the academics, and there was no student with bad character who was good in academics, even though they were very intelligent. Universities want to take Gurukula kids who have character, even though there are sometimes some shortage in academics. Serious education may be started at the age of 5 or 6, not earlier. The real point of being a parent is to help the children to be Krsna conscious. Of course, these souls at some point will be brought to Krsna consciousness, but we can just take part. The modes do their work, we do not have to worry about it, but we as devotees have the choice of not being under the modes. When Daivi-varnashrama is looked at from the viewpoint of service, there are no more prestigious and less prestigious positions. Even though the modern talks about equality, they differentiate so much based on the degrees. 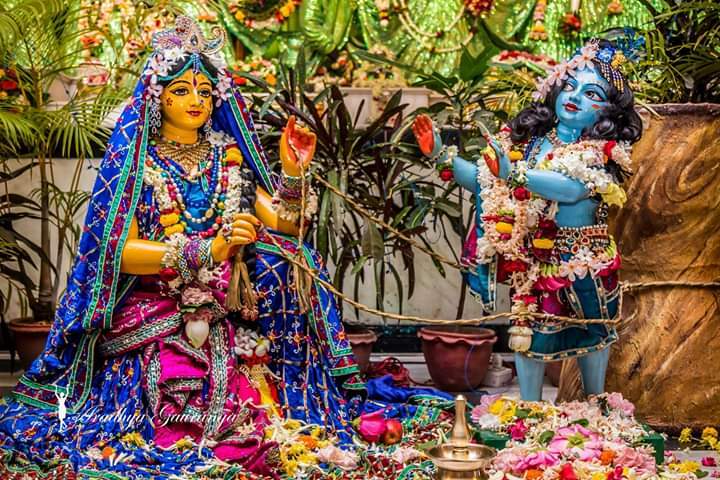 We do not want to accept varnashrama because we don’t want to be in a lesser position, but if things are seen in connection to Krsna, there are no lesser positions. The more character, responsibility and morals one has, the better they can be engaged in devotional service. Morality had no value unless it is connected to Krsna. The only reason good qualities are emphasized are due to their usefulness in devotional service. All the cultural activities prepare one for actual initiation. There are two types of mantras – Vedic Sanskrit and Classical Sanskrit. In the Vedic Sanskrit each syllable has a specific tone, and changing tone changes the meaning of the words. There are only 2 people in our movement who know Vedic Sanskrit – Srila Prabhupada and Bhanu Maharaja. In the Vedic karma-kanda yajnas, the whole endeavor is ruined by a little fault, but in bhakti small faults are being adjusted. However we should not use bhakti as an excuse to throw out rules. One either follows the eternal religion, or one makes up one’s own rules. There is no cramming in the Vedic education. There is no children education in the Vedic system, the children learn parts of adult education that they can learn. All of memorization is done by little children. From about 13 everything needs to become useful and practical. As an adult one learns the subtleties and philosophy, metaphysics etc. Vedic education starts with principles, structure, and builds on the details. Activity is the basis of language. The verb is the core point, noun is a form of activity. All nouns are connected to verbs. There are 24 parts of speech, verb and 6 parts of noun are the main 7. Modern cannot properly define the parts of language. Language is meant for communication, but the modern does not understand even that. Mathematics and astronomy are meant to establish the proper times. The whole Vedic mathematics is based on addition. Subtraction is addition reversed, multiplication is addition in groups, division is subtraction in group. Algebra is just arithmetics were multiple functions go on at the same time. Modern academics would not like things reduced down to just aritmetics because it is all just about speculation, while Vedic is about understanding things and then applying them. The rituals are only in expression of devotion to Krsna. One should focus on the devotion to Krsna in the rituals, not on the technicalities. Some boys upon graduation have already done 10,000 yajnas, while devotees in the West may do a few yajnas a year. There is always preliminaries, the process itself and then the conclusion in the rituals. If one understands that, it becomes easier to understand the purpose of the rituals. The procedure of acamana takes up 1.5 pages when written down, but so does the description of a handshake. Everything in philosophy fits within sambandha, abhideya and prayojana. Everything in our philosophy fits within sambandha, abhideya and prayojana. Srila Prabhupada makes the point that in educated circles things are always presented according to Pancanga-nyaya. Everyone will go through the same 14 books of Vedic knowledge, so they all have the same culture. Then one has one’s occupation, then there are hobbies. One may know music, but one is not an artist, unless one uses music as one’s occupation. Even though one does yajna only once a day, the whole day one practices the proper behaviour and culture that one will use in the yajna. Srila Prabhupada gave the pancaratric lifestyle when he noticed that nobody was reading the books and therefore could not answer bogus philosophies. If one has the training in science, one can deal with the art properly. Education starts in a classroom setting, but once a child has learned how to learn, it moves into tutor system where each child moves at their own pace in each subject. Varnashrama college is part of Gurukula. All English classes are happening at the same time, so one can be present in whatever level one is at. Then Math class starts, so one can go to another level if one is more or less developed in it. The Vedic system is the most sophisticated, but at the same time it is very simple and not complicated. A quarter is learned from a teacher, a quarter from self-study, a quarter from others and from experience in life. The quality of one’s character will determine the quality of one’s realization. One may graduate at 16-18, or 25, or 32, whenever the individual has completed their education. Individuals have to choose from activities recommended in the shruti, smriti, and things recommended by the acaryas. Bhagavata-viddhi is enough, but since we are conditioned, we have to apply the Pancaratra. Without proper education people will not know that the goal of life is becoming God conscious. There are strict rules in the Vedic system, but they are applied to the individuals. Question: Why women need protection on all levels? Why do they need to develop those qualities, chastity and satisfaction? How are those two connected?